Below is an excerpt from an article I wrote for the San Francisco on-line news source BeyondChron. The article, titled Federal Disability Regulations Face Historic Delay, appeared in the November 30, 2015 edition of BeyondChron. In 1999 a little known federal agency called the United States Access Board had a good idea. Nine years after passages of the Americans with Disabilities Act (ADA), the Board issued an official notice of its “intent to establish a Public Rights-of-Way Access Advisory Committee.” The committee’s job was to make recommendations for accessibility guidelines for public rights-of-way covered by the ADA. Public Rights-of-Way are streets, sidewalks, pedestrian crosswalks and signals. Accessibility issues include curb cuts, barrier-free sidewalks and detectable warnings (those yellow bumpy strips that help a blind person distinguish the street from the sidewalk). Crossing signals that give audible and tactile versions of the standard “walk/don’t walk” visual signals are also part of making the public right of way accessible. The Access Board was right to think that accessibility guidelines for these issues were needed. And they were smart to establish a panel of experts to help write those guidelines. The committee was established and the Board issued draft guidelines in 2002 and again in 2005. It took until 2011 for the Access Board to issue a Notice of Proposed Rule Making (NPRM) – a required step before final regulations. It issued a second NPRM in February 2013. Earlier this month the Board announced that the final rule would not be issued until October 2016. And this date could be pushed again in the future. A process that began in 1999 still awaits issuance of final rules. Advocates are insisting on accessible public rights-of-way even without the help of Access Board regulations. The San Francisco Municipal Transportation Agency (SFMTA) has one of the most robust programs for installing accessible pedestrian signals (APS) in the country. This program is the result of community advocacy lead by the California Council of the Blind, the San Francisco LightHouse and the San Francisco Independent Living Resource Center (SFILRC). These organizations and the City used Structured Negotiation, an alternative dispute resolution process, to negotiate a detailed agreement about APS that included details that are the subject of the Access Board’s not-yet-finalized regulations. The City announced its APS program in 2007, and expanded its program in 2010. Good thing no one was waiting around for federal regulations. This article is about delayed federal regulations. The federal government in the United States began working on regulations about safe streets for disabled pedestrians in 1999. The regulations would provide details about crossing signals that let blind people know when it is safe to cross the street. There are still no final rules about this. 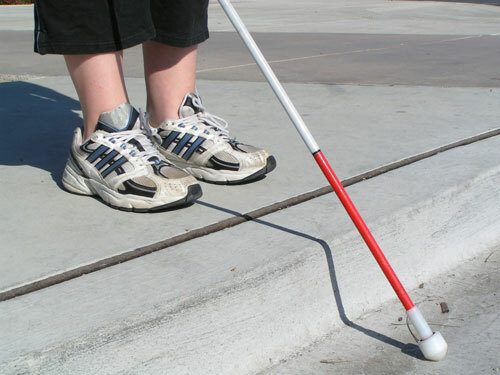 Blind people are not waiting for rules. They worked with San Francisco to make sure the city installed the audible signals. This article was first published on another website called BeyondChron.